Entry 77: Where are you from…. No… where. are. you. F-rom? I’m used to people trying to guess my ethnicity. It’s such a random thing to happen, but happens more than you think it would. I don’t know what it is, but it’s like a big puzzle people are trying to figure out for whatever reason. In Washington, it was always other Asians trying to guess what type of Asian I was. More specifically, older Asians ladies from the motherland. Where are you from? They would ask. It took me a little bit to realize they were asking me my ethnicity. I’m Filipino. I’d say again, sticking to my original answer. This then opened a Pandora’s box of questions, including the question of if I spoke Philippines, which isn’t a thing, but I gave them a pass for English being their second language. I do think, however, that at some point someone should correct them because it’s just going to cause confusion in future conversations with other people. But now that I’ve moved to the desert, it is the ex-military men who seem to be wanting to play the ethnicity game. Maybe they see me and get flashbacks of that one time they got stationed in the Philippines. I don’t know, but they curiously ask, and maybe it’s because I’ve gotten much darker since moving to the desert, but they always get the fact that I’m Filipino right. You’re Filipino. one vet stated while I was waiting for my take-out order of wings at the local Hooters (Don’t judge, they got good wings) . He didn’t ask as if he didn’t know for sure, he said it as fact. “Have you ever been back?” he asked. At which point I explained that I’ve never been there (I know, such a bad Filipino). My dad’s from this region, I explain, and my mom’s family is from this city and so on and so on. The vet then proceeds to tell me everything he knows about Filipinos, about how he’s got a Filipino girlfriend who came to America on a fiance visa and how she broke up with her fiance and was now with him, and how he was in Manila back in ’92, and all the women there were beautiful. And did I eat rice? We obviously had a connection, but in the back of my mind…I really didn’t care. I wanted my wings to hurry up so I can leave. It’s was probably totally rude of me to think that. Said ex-vet was probably just excited that he had met another Filipino to talk Filipino stuff with. I get excited whenever I meet other people from Seattle. The other day I was driving in the neighborhood and saw the cars of our new neighbors with Washington license plates parked in a house that been on sale. I wonder if they’re Seahawk fans! I excitedly thought to myself, perhaps even imagining us carpooling to the Seahawks bars during football season. So yea, I get it. Well, I hope everyone is doing great, I know it’s been a hot minute since I wrote something, but I doubt anyone was sitting at the edge of their seats wondering what was going on with me, saying to themselves…I need this bloggg! Like I need my coffeeeee. If you were. I’ve just been busy. Me and husband went to a horse race over the weekend. I was overdressed with my stilettos and tight pencil skirt, while everyone seemed to dress down with jeans and cowboy boots. I stuck out like a sore thumb, but how was I supposed to know? Everything I know about derbies is based on what I see on TV with the Kentucky Derby and how they interview celebrities beforehand to see what their wearing. 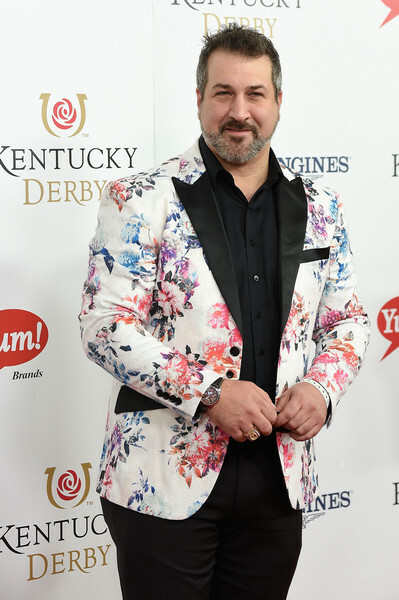 In case you were wondering, this is what Joey Fatone wore. But note to self, small town Derby… Dress down to blend in. Quantico – The thing that made me give this show a chance was because the main actress Priyanka Chopra is going to Prince Harry and Megan Markle’s wedding. I know that’s a completely stupid reason to start watching a show, but I’m already 6 episodes in. What I don’t like about the show is how one of the actors looks like he wears mascara. It bugs me whenever the screen goes to him. It’s like, how are your lashes so extra right now? It’s completely unfair how a lot of men I know have lashes that are better than most women. I also looked up the actress, and she’s been in a few Bollywood movies that I’ve actually enjoyed. Yes, I watch Bollywood quite often, and if you’ve never given it a try, you should. There’s a lot of dancing and singing. My face during this whole scene was like…. Next Article Entry 78: Oh, Canada – How The Airlines Lost Our Bag. Hahaha ! Hey I really enjoyed reading your post at the same time I was imagining the whole situation in my mind…😂😁 ! The most amusing post I came across today 😀 love it .